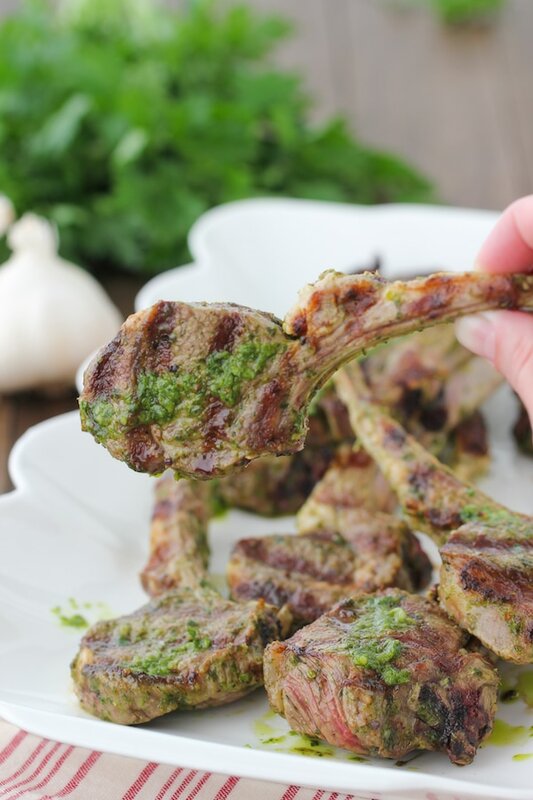 Grilled Lamb Chops are such a special treat, especially marinated in a Chimichurri Sauce, which gives them a really terrific garlic and herb flavor. It’s so easy and quick to prepare and is perfect to serve for special occasions when you don’t want to spend too much time in the kitchen. Lamb is most definitely a great option when you want to serve something special for company or for holidays and special occasions. It’s delicious, impressive and could’t be easier to make. Lamb chops are so tender, as long as you don’t overcook them, and I will show you a few tricks how to get a great sear on the outside without overcooking the meat in the center too. I think it’s especially wonderful for the days when you just can’t commit to anything that requires time consuming prep work. 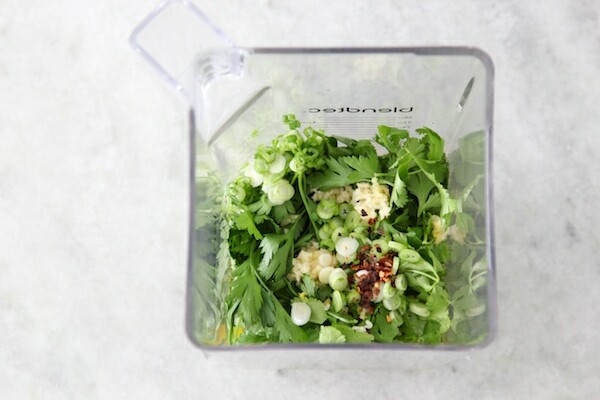 It literally takes a few minutes to make the sauce – just mix everything up in the blender. 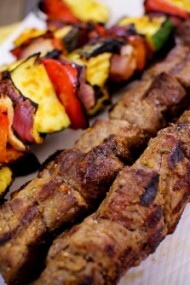 The sauce is used both to marinate the lamb – but you can put it on the grill right away, no need to wait for a long time. You can also marinate it in advance. Preheat the grill on high for at least 20-30 minutes, covered. 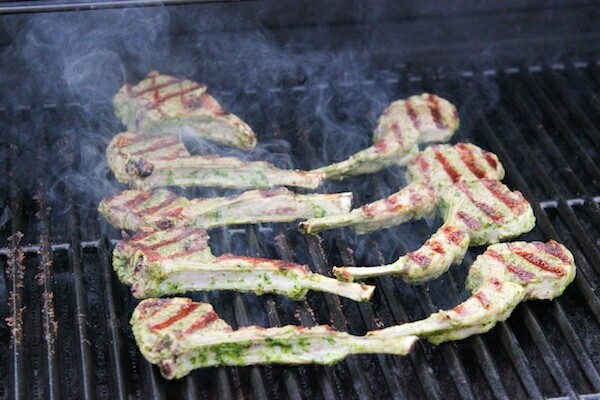 It is very important to get the grill as hot as possible, so that you can get a great sear on the lamb chops. 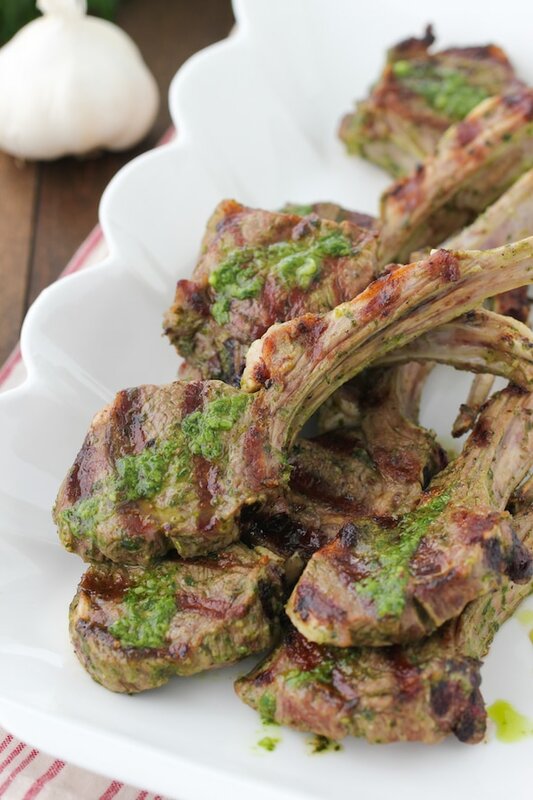 Since lamb chops are thin, they cook really quickly. If you put them on the grill when it’s really hot, it will help to start getting great sear immediately. 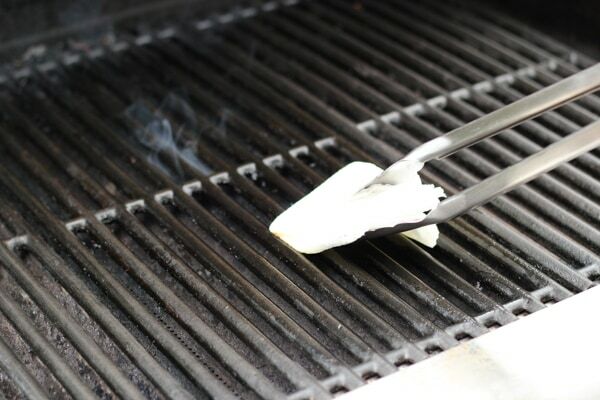 Clean your grill grates. Take a wad of paper towels and holding them with a pair of tongs, dip them into a small bowl of oil and brush the grill grates 3-5 times. This will help to create a barrier on the grates, making them somewhat nonstick. 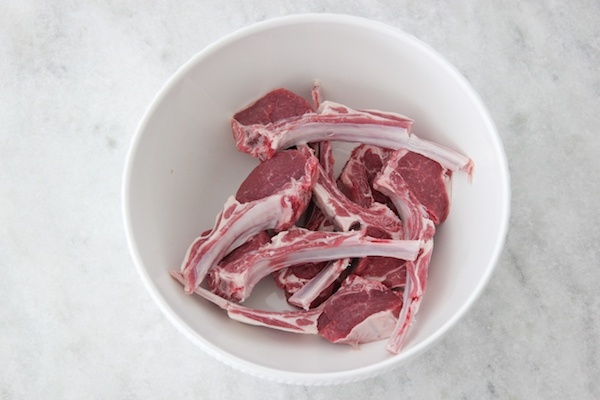 What Meat Should You Buy When Cooking Lamb Chops? Lamb chops are sold in three different ways. Partially or fully frenched rack of lamb – this is where part of the fat cap is trimmed and the end of the bones are either fully or partially cleaned (this is called frenched). I recommend buying the partially or fully frenched rack of lamb. When you buy the lamb chops that are cut already at the store, they are often butchered very unevenly and you have very thin, jagged lamb chops. Many times they are so thin, that it is impossible to get a sear on the lamb chops without overcooking them on the inside. Plus, it’s usually much more expensive. When you buy the untrimmed rack of lamb, you will need to cut off A LOT of the fat cap and it will just be discarded, so even though it’s supposedly more economical, it won’t be by the time to cut off and throw out half of it. Plus, cleaning the rib bones is a lot of fussy work – it’s not hard, but time consuming for sure. I bought the partially trimmed rack of lamb at Costco. 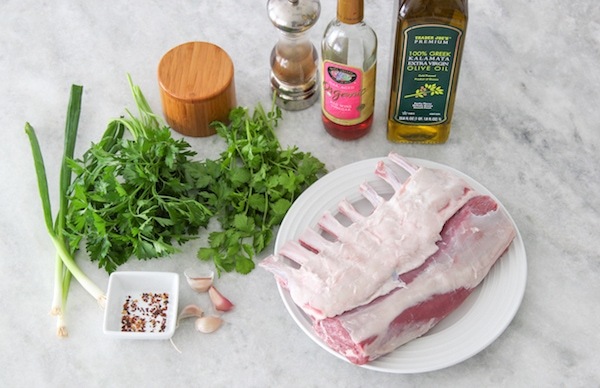 If you buy the partially trimmed rack of lamb, the prep is very minimal. Trim off some of the excess fat cap and discard. 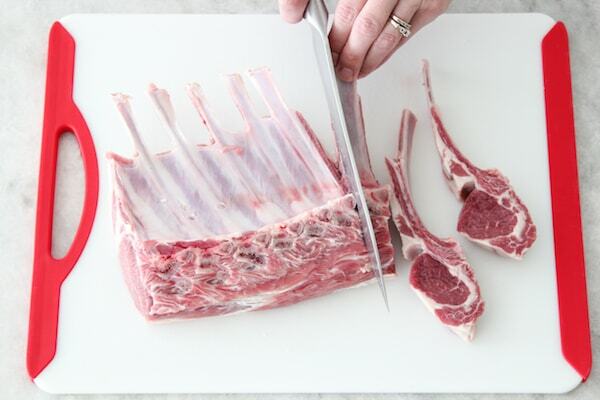 Use a sharp knife to cut the rack of lamb into individual chops, by cutting in between the rib bones. Season the lamb chops evenly with salt and ground black pepper on both sides. Set aside in a large bowl. 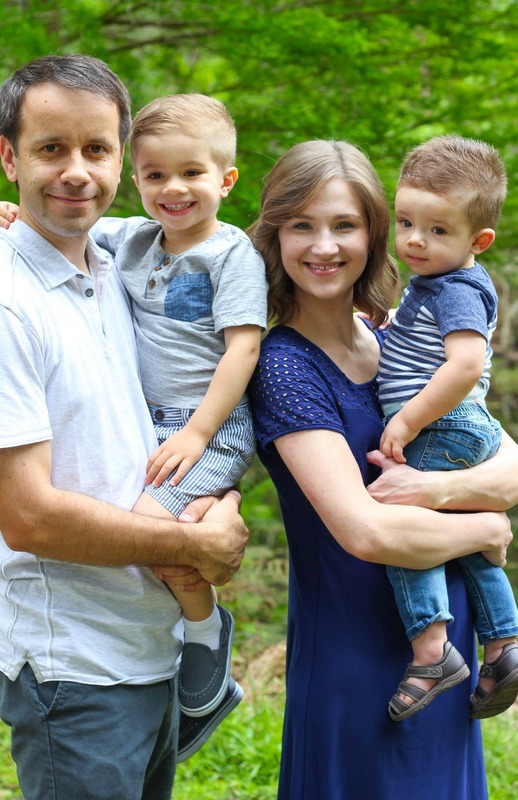 What is a Chimichurri Sauce? Chimichurri is a really flavorful Argentinian garlic and herb sauce. It packs a punch of flavor in each bit. It is based on olive oil, fresh garlic and herbs, mostly parsley. I love adding cilantro and green onions too. You can also add any other fresh herbs that you like for additional flavor variations. In this version, I use red wine vinegar for the acidity. 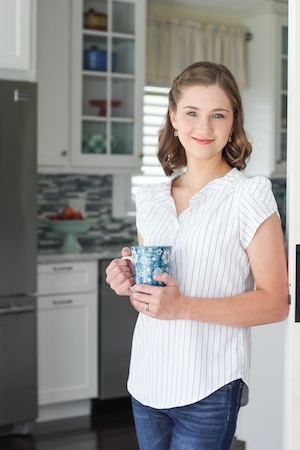 You can also use other vinegars or lemon or lime juice. For a touch of heat, I used crushed red pepper flakes. You can also use fresh jalapeño or other hot peppers in place of the red pepper flakes and it tastes phenomenal too. 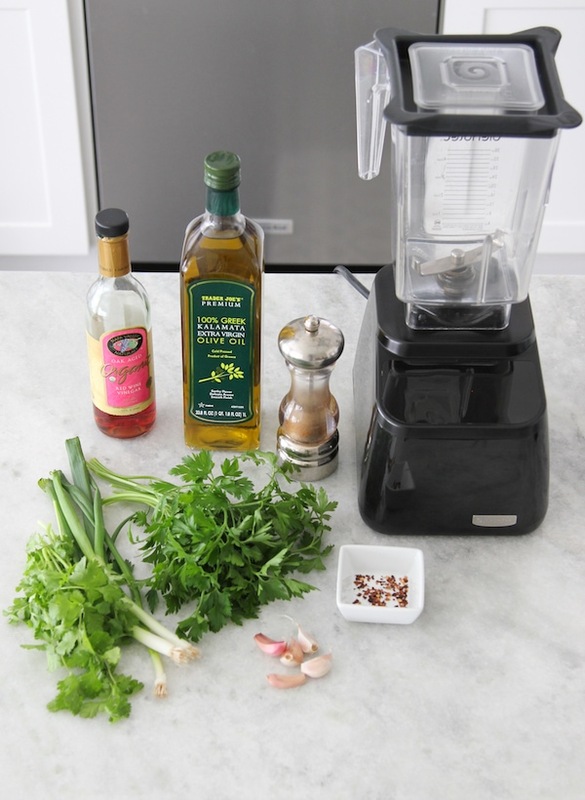 The Chimichurri Sauce can also be used for many other recipes, like grilled or poached chicken, beef, pork or seafood. Steaks with Chumichurri sauce are out of this world! You should definitely give it a try. 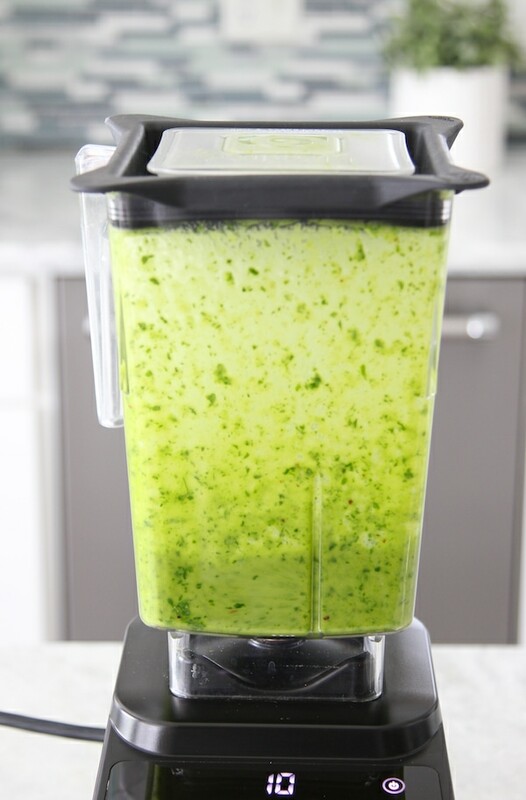 If you have a good blender, it couldn’t be easier. Just add all the ingredients to the blender and process until smooth. 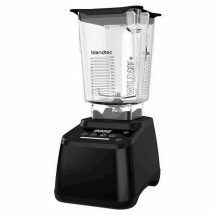 If you don’t have a blender you can also use a food processor. You can also just use a knife and minced the garlic and the herbs as small as possible and then mix with the olive oil, vinegar and crushed red pepper flakes. Take the leaves off the parsley and the cilantro. Pack them into the measuring cup to measure. Slice the green onions/chives. Mince the garlic or press through a garlic press. Doing this beforehand will help all the ingredients to process evenly. Process all the ingredients in the food processor until smooth. Reserve at least half of the sauce to be served on the side with the grilled lamb chops. 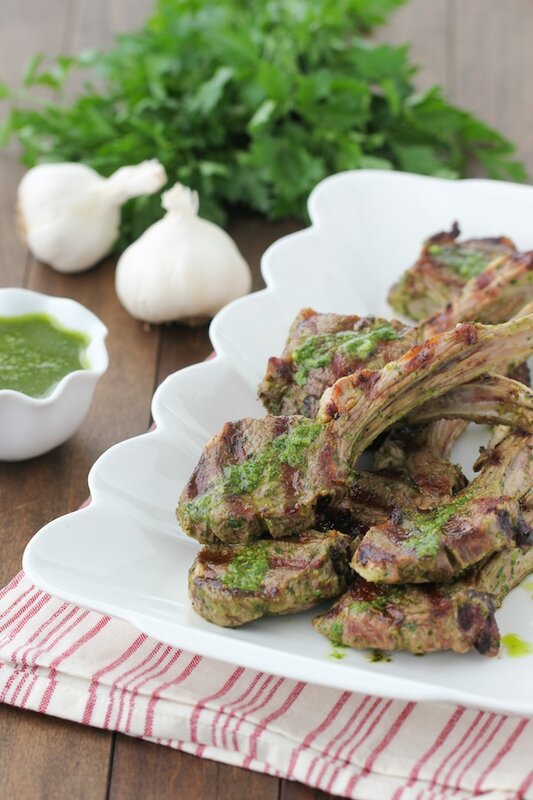 You will have more than enough Chimichurri Sauce to marinate up to 2 racks of lamb, but don’t make less than the full recipe if you are using the blender or the food processor. The sauce won’t mix properly if you don’t have enough ingredients. Extra sauce is delicious to be served with the grilled meat and you can use it for many other recipes for another dinner. There is no need to marinate the meat for an extensive amount of time unless you want to prep it for your own convenience. Otherwise, just pour the remaining sauce over the lamb chops and mix until the sauce is evenly covering the lamb. 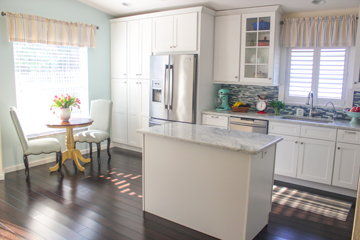 If marinating in advance, keep the meat and the reserved sauce refrigerated, tightly covered. 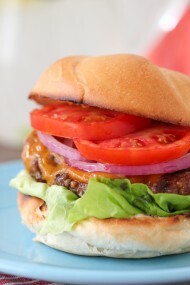 Remove from the refrigerator and allow to come to room temperature for about 20 minutes before grilling. 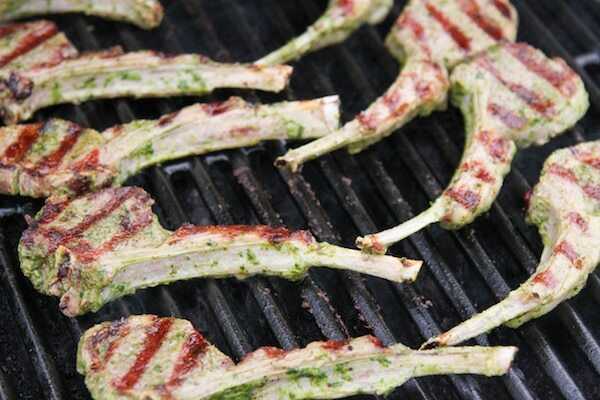 Place the lamb chops on the diagonal on the preheated grill. Cook, covered, for about 5 minutes, until you get a nice golden color and sear, flip to another part of the grill that is also hot, so that the second side is placed on searing hot grates as well. Grill for another 3-5 minutes, depending on how thick your lamb chops are and depending on how you like the meat to be cooked. 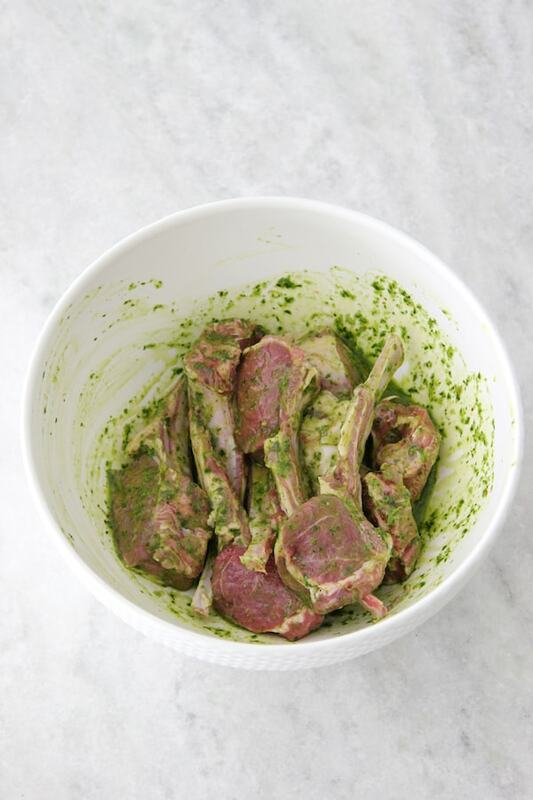 Serve the lamb with the reserved Chimichurri Sauce. 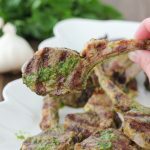 Grilled Lamb Chops are such a special treat, especially marinated in a Chimichurri Sauce, which gives them a really terrific garlic and herb flavor. 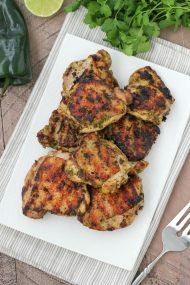 The Chimichurri Sauce can also be used for many other recipes, like grilled or poached chicken, beef, pork or seafood. Preheat the grill on high heat for at least 20-30 minutes, covered. Clean your grill grates. 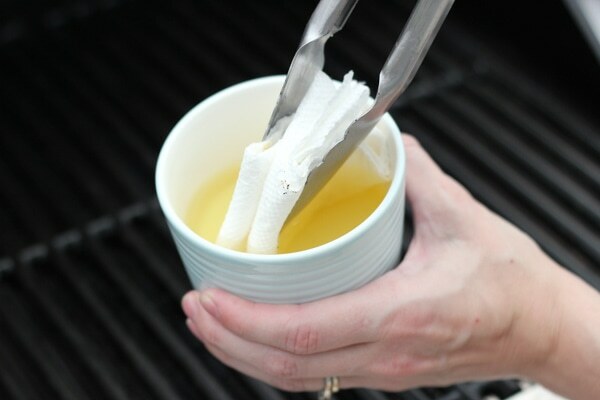 Take a wad of paper towels and holding them with a pair of tongs, dip them into a small bowl of oil and brush the grill grates 3-5 times. This will help to create a barrier on the grates, making them somewhat nonstick. 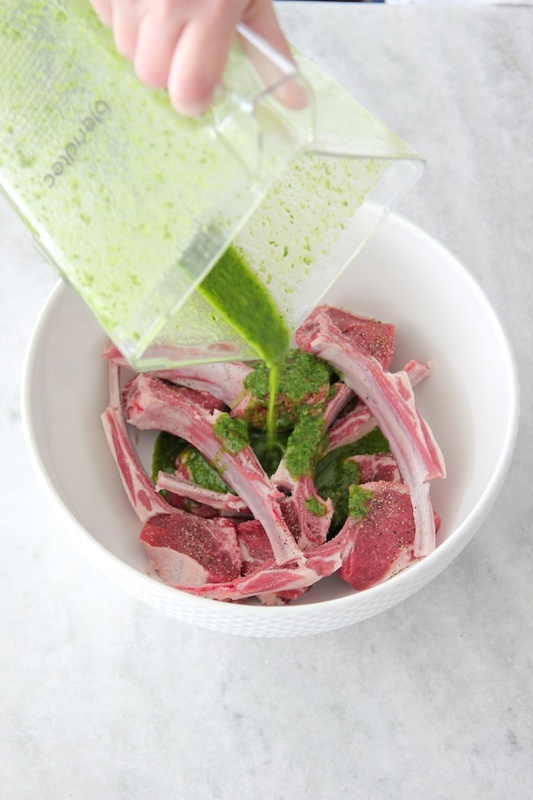 Prep the lamb chops. 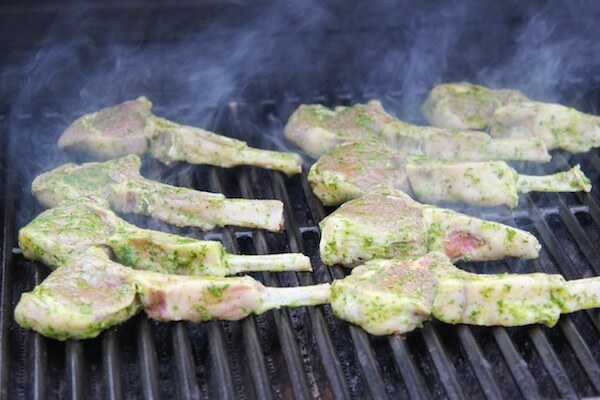 Trim off a bit of the extra fat and cut the rack of lamb into individual chops, by cutting in between the rib bones. Season the lamb chops evenly with salt and ground black pepper on both sides. Set aside in a large bowl. Process all the ingredients in the food processor until smooth. Reserve at least half of the sauce to be served on the side with the grilled lamb chops. Pour the remaining sauce over the lamb chops and mix until the sauce is evenly covering the lamb.